As part of The Youth Field Makeover Project presented by Orkin, Churchland Little League in Portsmouth, VA has won a contest in which the Tides organization will renovate their baseball field. 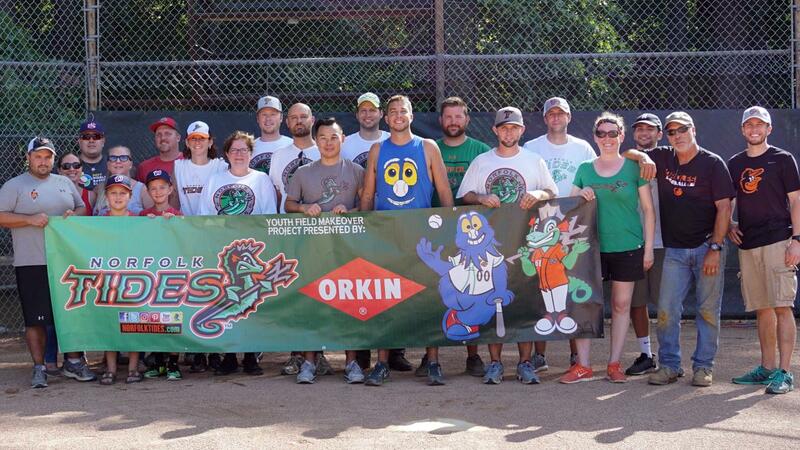 This field makeover will include an upgrade to the playing surface, an improvement to existing dugouts, and pest prevention services courtesy of Orkin. The field renovation is set to take place this fall. In addition to Churchland Little League, the Tides will also be renovating Thalia/Malibu Rec Association in Virginia Beach, with that renovation set to take this fall. Thalia/Malibu Rec Association won that renovation in a contest that took place in February. "We are continuously amazed at the outpouring of support we receive each time we run these contests" said Tides General Manager Joe Gregory. "Our entire organization is excited to help make a difference for the young ballplayers in our community." Since the inaugural renovation in 2012, the Tides have renovated 11 fields in the Hampton Roads community: Ocean View Little League (Norfolk), Smithfield Recreation Association (Smithfield), Bennett's Creek Little League (Suffolk), Phoebus Little League (Hampton), Shore Little League (Nassawadox), Cradock Little League (Portsmouth), Little Creek National (Norfolk), Gloucester Youth Baseball (Gloucester), Surry County Pony Baseball (Surry), Deer Park Youth Field (Newport News) and Eason's Crossroads Ballpark (Gates, NC). The project is made possible thanks to the Tides Youth Baseball Fund, a program established by the Tides in 1990 as a way to raise money for youth baseball and softball programs in Hampton Roads. In addition to assisting with field renovations, the Youth Baseball Fund also helps local teams and leagues with travel expenses. The Youth Baseball Fund is partially financed by scoreboard announcements at Harbor Park throughout the season, and those wishing to make a donation directly to the Youth Baseball Fund can do so via norfolkides.com under the "Harbor Park" section. Season tickets, group tickets, picnics and patios are currently available for the 2019 season. For pricing and additional information, visit the Harbor Park box office or call (757) 622-2222. For more information about Orkin's pest control services, visit Orkin.com.